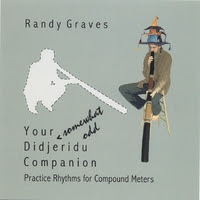 Randy Graves is a didjeridu player, composer and teacher. He has a series of instructional CDs for the didjeridu which range from meditative, mixed up to straight ahead. Now, you don’t have to be a didjeridu player/student to learn from this CD. He breaks down the compound meters first slow, fast then with just sticks. Before a couple of the exercises, he will play a sample from his recorded work so you can get a "real life" feel. These exercises can help you really feel these particular compound patterns of each meter. Once you get the feel of these patterns, then it is easier to experiment with in that comfort. Plus it is neat just hearing a droning instrument playing these patterns. Now I can drone out to 13 instead of 4, very important. Anybody who teaches odd meters on the didjeridu is way cool in my book. His solo work and former band “Diginus” are worth checking out. He likes to use odd meters and from what I have heard the instrumentation is worth investigating and the writing is capturing. So if you are looking for some more ways to practice your compound meters, here is a different approach that might take you in a new creative direction.